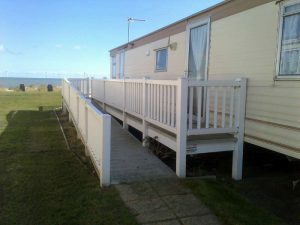 The caravan has a sea view and a veranda, with a car parking space next to the caravan. This park is flat and adjacent to a sandy beach with sand dunes. There is a grassed area in front of the caravan with a few wide steps leading to the sand dunes. The park is at the end of Great Yarmouth’s promenade. The facilities include a heated indoor fun pool with flumes and separate children’s pool, outdoor children’s splashzone, adventure playground, play area for under 5’s, fun palace, all-weather multi sports court, games room, amusements, bakery, gift shop, off licence, Mash & Barrel Café/Bar, Fish and Chip shop, Burger King, Papa John’s and two Showbars for family entertainment. The Great Yarmouth Racecourse is nearby which is open from June to September. The Park Entrance is on a public bus route – with restricted service from Easter until Whitsun and from October onwards; although the Seafront Road Train also goes to the Park Entrance during the whole season. Our caravan has two bedrooms, one with a double bed and one with a single bed. There is a facility in the lounge to make up a double bed and one person can sleep along the sofa area (six berth). Both bedrooms have ceiling pulleys above the beds. The caravan is adapted for wheelchair users. There is a 7″ lip in the shower. There are ceiling heaters in the bedrooms and bathroom and an electric fire in the lounge.